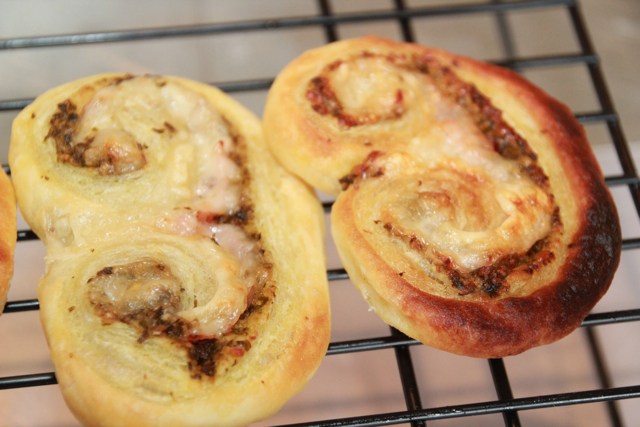 OK, this one is super easy (keeping with my theme) and a great appetizer. What could be more down to earth than ham and cheese?! 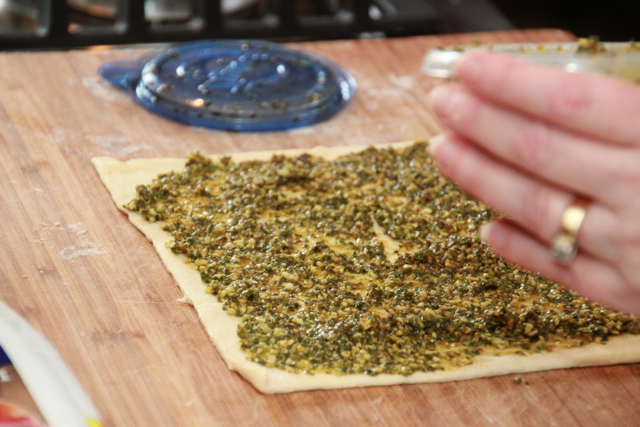 Now, add to that; pesto and puff pastry and you will have a unique dish that will be the hit of any party!! Ready . . . let’s do this! 1. 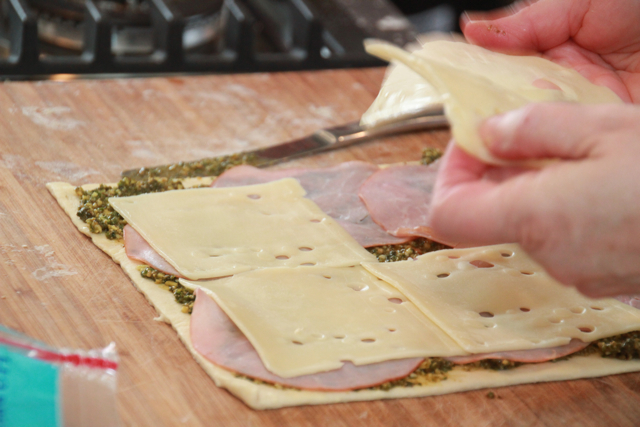 Spread the pesto over the sheet of puff pastry dough, top with ham slices then cheese. 2. 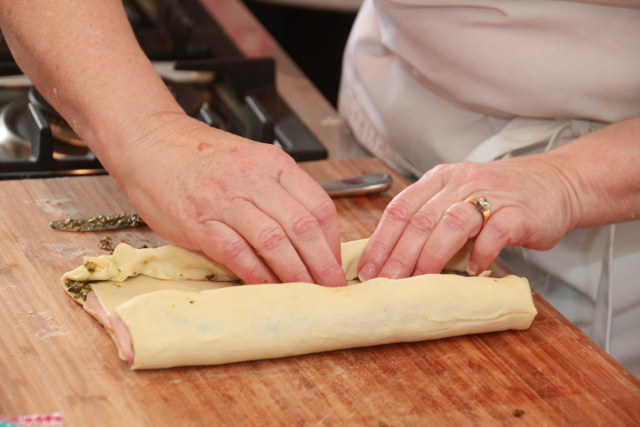 Start rolling the long side of the dough and continue until reaching the middle of the pastry sheet. Roll the opposite end in to meet the first roll. 3. 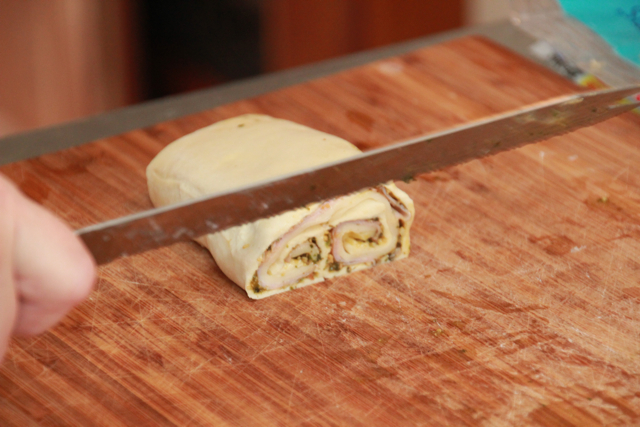 Cut the roll into half-inch thick slices with a bread knife. Place the slices on a cookie sheet lined with parchment and bake at 425 degrees for approximately 15 minutes or until golden brown. Once again, thank you for your continued support and for reading! For information about our upcoming cooking classes or to customize you own private cooking class/party visit MY WEBSITE. OK Picture this: you’re sitting at a quaint little sidewalk bistro in one of the quaint little coastal towns in Southern California. You sip on your class of wine as you watch the people parade up and down the street. The lighting just perfect with the sun filtering through the massive Ficus trees lining the street, warming the otherwise cool ocean breeze. Finally your order arrives . 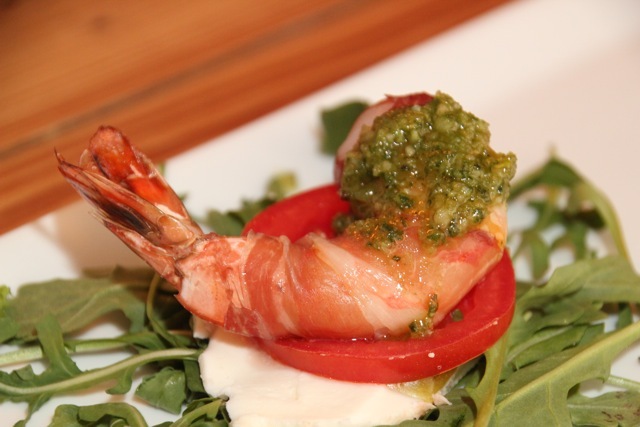 . . giant shrimp wrapped in prosciutto, sitting on Roma tomatoes and fresh mozzarella cheese, topped with creamy pesto sauce. Life just got a lot better! My husband, Pat and I first tasted this delightful dish under the circumstances I just described for you. Since that first tasting, this has been one of my favorite appetizers on the planet. Every time I taste this delicacy, I am instantly transported back to that scene in the little beach town. Come and enjoy that little beach town with me . . . through their food! Place shrimp in shallow dish and add salt, pepper, and extra-virgin olive oil. Toss shrimp to coat evenly. 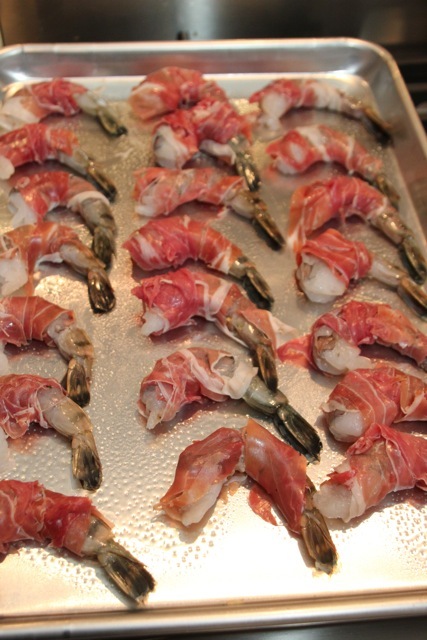 Cut prosciutto length-wise for a total of 10 strips, then wrap each shrimp with the prosciutto strips. Arrange the shrimp appetizers on a platter, and don’t forget to put out a small empty bowl near the shrimp platter to collect the tails. This recipe is easy to make for larger groups. I don’t have to hope . . . I know you will enjoy this recipe!